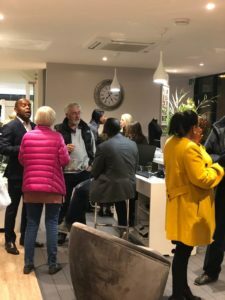 The brand-new addition to our branch in Wimbledon Village, the Raynes Park site is an all-encompassing store with a homely yet sophisticated feel, so you can feel comfortable and well taken care of as we expertly create designs made to measure just for you. 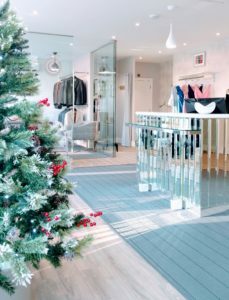 A night of canapes, champagne and of course, beautifully made clothes. 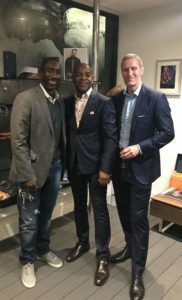 Former Chelsea legend and long-time client Jimmy Floyd Hasselbaink was able to join us in celebrating the opening night. As well as our alteration services we provide everything a bride would possible need for her outfit. With a quality selection of jewellery accessories and boleros. Looking for inspiration for those special women in your wedding? 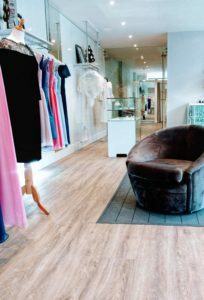 We have a range of bride’s maid and mother of the bride dresses as well as our bespoke service where we can design and create dresses to your desired fabrics, colour and style. Menswear : Luxury tailored to you. In our dedicated menswear tailoring section, you can feel confident and comfortable knowing the shirt and/or suit we create for you is expertly tailored to your exact measurements and in quality English or Italian fabric of choice. • The design process involves one-to-three meetings. 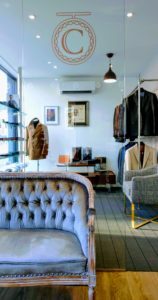 • Our head tailor can work with you to design your made to measure shirt, suit or overcoat with our bespoke design consultation. 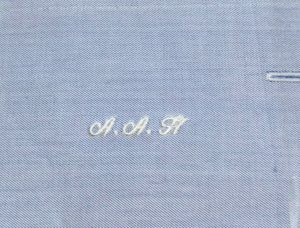 • Clients will enjoy exclusive access to an extensive library of classic Italian and English heritage fabrics of unparalleled quality. • Each design can be finished with your own embroidered monogram.